Small lid for our 4oz espresso cups. This lid is 62mm wide. No sip hole. Meet the world's first 100% compostable disposable hot cup lid! It's made of cornstarch-based PLA , can take high temperatures, and can compost in under 12 weeks. 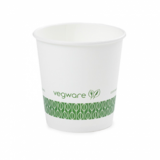 Compostable - biodegrades within 12 weeks.